Archive for the ‘How to…’ Category. How to give the gift of responsibility, year by year! Each year, you will receive a freedom in the form of a responsibility. If you handle it wisely, then you will be on track to receive the next gift from the responsibility box on your birthday. If you are not responsible with your freedom, then it may be revoked for a time and/or you may not be ready to receive your next gift. Remember that these are privileges that you earn, not rights. We know you want to be independent and we are giving you these steps to help you reach that. We want to help prepare you to leave home. This visual depicts how the responsibility grows as the child ages. in handling the freedoms and responsibilities of being an adult. Be ready to be in your room, settled down at appropriate time. Wake up on your own at an appropriate time. Get yourself ready on time. Keep your grumpiness to yourself if you didn’t get enough sleep. babysitting, staying home alone, bedtime, waking up, feeding pets, choosing clothing, getting a phone, mowing, pumping gas, driving, homework, curfew, shaving legs, managing own laundry, etc. What issues cause the most friction in my relationship with my child? Is there a way to give him “ownership” of something within family parameters? What are some small “gifts” (pumping gas) that will help build toward bigger “gifts” (driving a car). 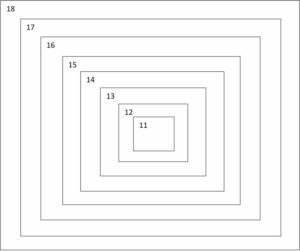 What is my child ready for according to his maturity? What should my child be able to do for himself at this age, but may need incentive to grow? What do I want for him to be able to handle for himself when he leaves home and how can I map out these “gifts” through the years so that he can be successful? How has this worked for my family? God’s timing is perfect, as always! 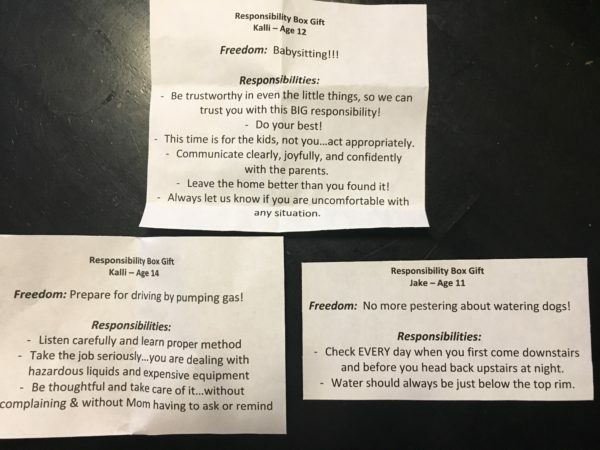 We were approaching my daughter’s 11th birthday when I went to a parenting class where the concept of the “Responsibility Box” was explained. 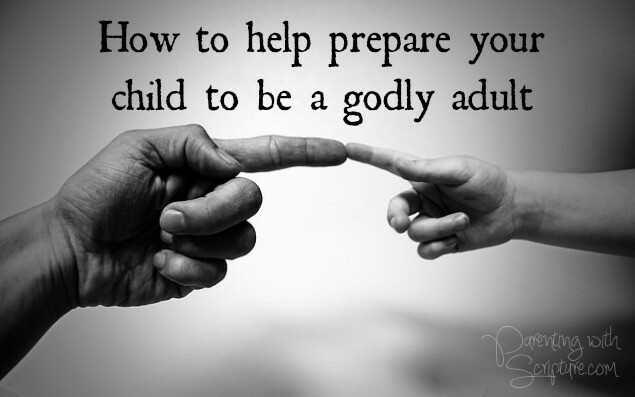 Our wonderful Associate Pastor, Jim Allen, and his lovely wife, Trish, had successfully used this approach with their children years ago and have been sharing it ever since. To give full credit, Jim and Trish originally heard about it from an Christian speaker named, Ken Poure, in the 1960’s-70’s. Jim built on Ken’s basic idea, including coming up with the helpful visual of the nesting boxes shown above. It resonated with me when Jim and Trish pointed out that often, the things that cause the most conflict are the areas where the child is needing to stretch his own wings and take on responsibility. Child gets freedom in the form of a responsibility. Parents get peace and can quit badgering! Such has been the case in every single instance since we started this 3 years ago. For example, our sweet Kalli is every bit as much of a night owl as Tim and I are. Bedtimes were always a challenge. I can’t tell you the relief it was to let that rest in her court! We all agreed that she needed to be in her room at an appropriate time, but it was up to her when she actually went to bed. FREEDOM FOR ALL! Then came the year that she got babysitting as a freedom. She had worked hard, taking the online Red Cross babysitting class and making business cards in preparation for turning 12 and being able to officially sit. She could hardly wait and already knew this would be one of the freedoms in her Responsibility Box on her birthday. 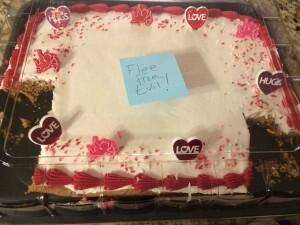 However, pretty much as soon as she had her birthday, she lost this freedom. Why? I will protect her and not share the details. However, it related to #1 item under the responsibilities associated with the freedom of babysitting. 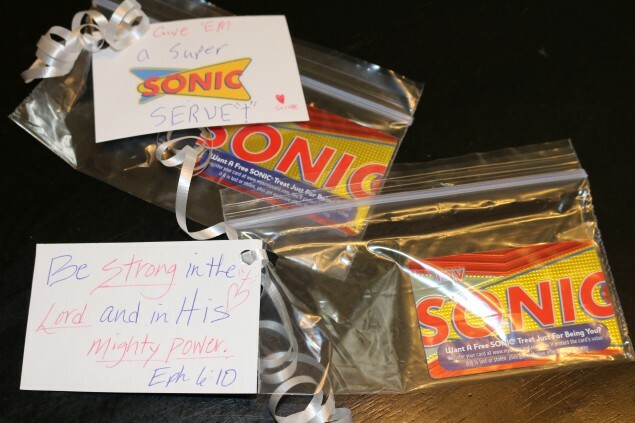 “Be trustworthy in even the little things so we can trust you with this BIG responsibility.” You may note that this echoes the Biblical principle of Matthew 25:23, on which the Responsibility Box is founded. Therefore, it was no surprise to her that she lost the freedom. And, the beautiful thing was that it wasn’t a battle. It was indeed disappointing, embarrassing, and painful for her to have to tell people she couldn’t currently sit when she was asked (we let her simply say she was grounded so she didn’t have to go into it). But, it helped her really digest that if she couldn’t be trusted with little things at home, it wasn’t at all appropriate for her to be trusted with other people’s children! As with many growth experiences, I’m thankful she went through this because now I know she’s that much more trustworthy as a result of this trial. After watching his older sister gain freedoms for a couple of years, our son, Jake, couldn’t wait until he turned 11 so he could get his own Responsibility Box. However, as every parent knows, each kid is different! Tim and I struggled and prayed to find things that he would be excited about but were at a level that he could handle. We had to get quite creative. We knew that he was so eager to have great responsibilities and freedoms but didn’t have the maturity yet. How could we help get him there? We took a look at what we had to pester him most about…one of them being watering the dogs. Hmmmm….how could we turn that responsibilities into a freedom? Well, we figured he didn’t care to be badgered anymore than we cared to be badgering him! So, we went heavy on discussing with him about how know he was ready to show us the independent dude he could be. We knew this “empowering” kind of talk would appeal to his desire to be a “man”…and sure enough, it worked! 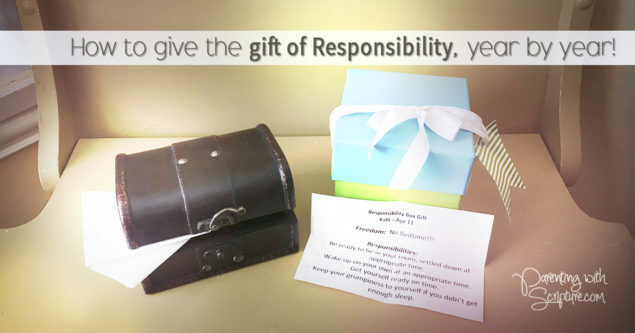 The Responsibility Box has over and over proven to help us back off and help him step up! I hope this idea blesses you as much as it has blessed our family! 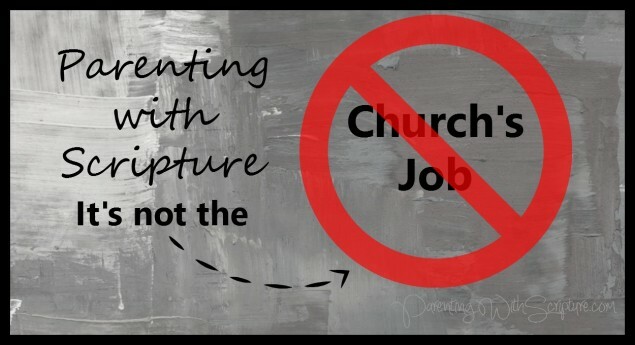 For more help with Christian parenting, check out Parenting with Scripture: A Topical Guide for Teachable Moments. that sounds lovely, doesn’t it?! But how do we go about that in our daily lives in practical ways? 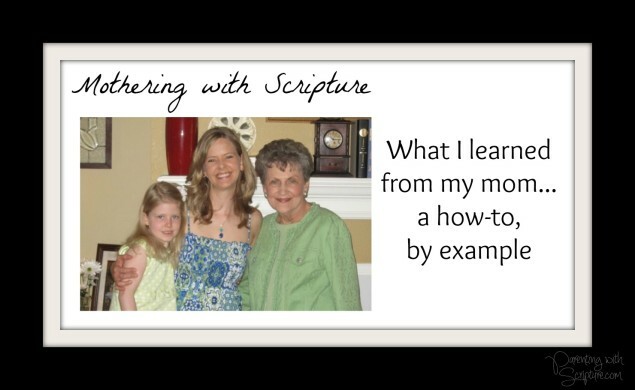 My mom did this beautifully and set the course for me knowing how to mother with Scripture. I would often catch glimpses of her with her Bible and prayer journal. Her life exuded the love of Christ and I knew that was from her close daily walk with Him. I am certain that is where she drew her wisdom as a mother. A favorite, consistent memory of growing up was bedtime. Mom made precious daily investments by reading me Bible stories, age-appropriate devotions, memorizing Scripture, and praying. I can’t understate the significance this had in establishing my own daily walk. She used daily examples to tie in Scripture and point to God. God wasn’t just something she checked off the list after her devotional. She walked with her best friend, Jesus, throughout the day. When a teachable moment popped up that reminded her of something from the Bible, she would share it with me or whoever happened to be around. She had such a sweet spirit that this wasn’t obnoxious, but made others want to grow closer to Jesus. She exemplified turning to God through prayer and seeking His Word in tough times. When she said she would pray for us, we KNEW this was true. 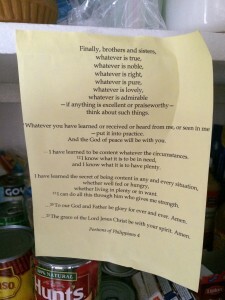 When life hit hard, she would share what God was teaching her and what verses were meaningful. Was she perfect? No. She would be the first to humbly admit her need for God’s grace. Just another thing that made her life so beautiful. I’m ever grateful for the legacy she left. She certainly blessed those who knew her and I hope she inspires you, too. Thankful that my daughter was into “tea-time” and inspired this sweet outing that ended up being our last Mother’s Day together (2009) this side of heaven. There was never any doubt in my mind when I was writing Parenting with Scripture: A Topical Guide for Teachable Moments, that I would dedicate it to her. Take a look at the dedication page and flip through to be inspired with more ideas for mothering with Scripture. Many of the “Parenting Tips” are things she did with me. Kalli’s Junior High Volleyball team was getting crushed last year. They were a young, inexperienced, small (only 7!) team that usually played much larger teams with older, more experienced girls. The first couple of games were brutal and the girls were quite disheartened. Then a mom came up with a brilliant plan! Shauna realized the girls needed smaller, more attainable goals to work toward rather than actually winning a game. She promised them cupcakes if they could get to 15 points in a set. Once they achieved that, the next goal was 20 points in a set for chicken nuggets. I’m sure it was amusing to those not in the know to hear us fans yelling out “CUPCAKES!” or “NUGGETS!” as encouragements! A win, which they amazingly finally achieved, meant an end of season slumber party! 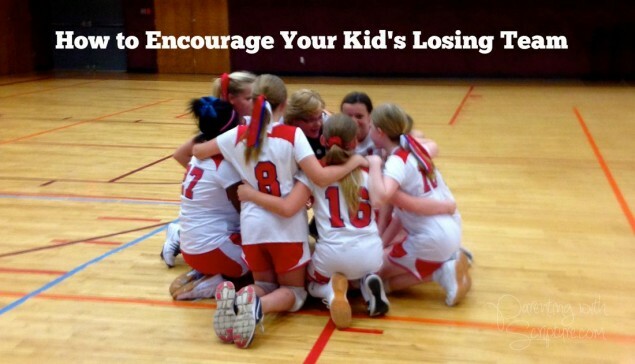 The opposing teams had to have been completely befuddled by our extreme joy, cheering, and pride in our girls after each game…especially all those “lost” games. What they didn’t know is that we were elated about the improvements and increasing victories of calling the ball, working as a team, growing skill, and more points! By the time our team actually won a game, we were so thrilled you’d think we had taken the state championship! Thus, the season became less about winning and more about growth. It was a blessing to see the girls’ confidence increase and attitudes brighten with each game. Yes, we will all remember how hard that season was. You can’t lose that often and badly and it not make an impression. However, I’m thankful Shauna saw an opportunity to teach the team (and parents!) lessons of persistence, encouragement, and keeping positive when things are down. Here’s a way a teammate encouraged the remaining 6 girls when she was injured and unable to play. I’d love to hear any non-food ideas you’ve seen or tried. Please share!